What is a Color Correction? How Do You Know When You Need One? Hi TouchUps Family! 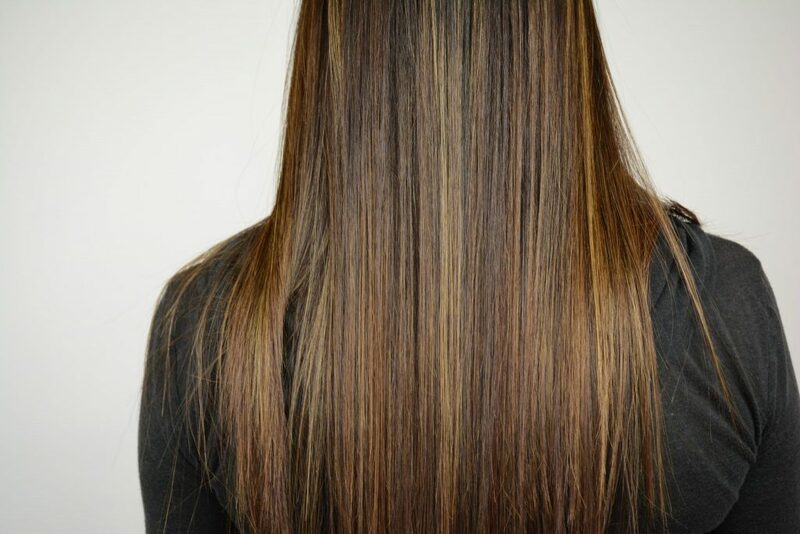 Have you heard your stylist use the term “color correction” before? Maybe you’ve had one done before and wonder why it was so expensive? Well, we’re here to give you the answers you need! Most of our stylists here at TouchUps Salon in Chandler, AZ have done many, MANY color corrections in their careers. It’s a long and grueling process, both for the client and the stylist, but the end results are always worth it. The “before” of a color correction by Victoria. So what IS a color correction? There are many types of color corrections, but the two most common color corrections are making really dark hair much lighter, and making really light hair much darker. Have you ever gone into the salon after you colored your hair with box color and asked to be really REALLY blonde? Getting you to be super blonde after using dark color on your hair is not nearly as easy as you think it is. You’re hair will need to be bleached to get you to the desired level, but it’s not as simple as throwing some bleach on and walking away. 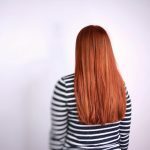 After using box dye, your hair will be more prone to lift, or lighten, with reddish/orange tones, or lift unevenly. (No one wants orange stripes in their hair!) The stylist then has to use more color on top of that to cancel out any and all unwanted tones in order to achieve your desired color. 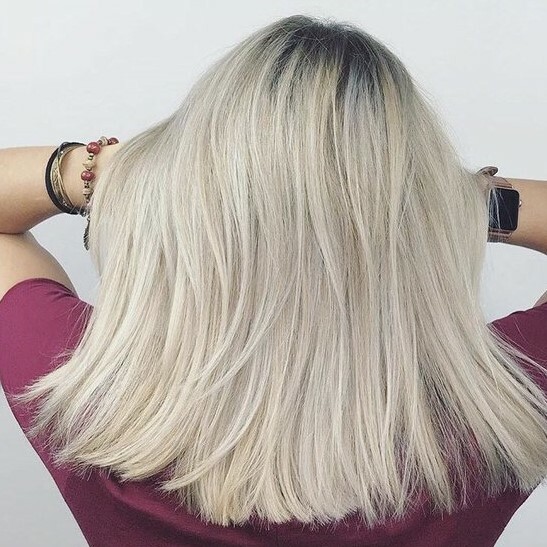 If you’re platinum blonde and want to go a darker color, the stylist will need to fill your hair with a color like a red, as blonde hair does not have any pigment, and then put the desired tone on top of the filler after it’s rinsed out. If you’ve ever tried to put a dark color on your light hair and it washed out right away, that would be because your hair does not have any warm pigments for the dark color to grab on to! Some color corrections are a lot easier than others, as some can be done in one appointment while others can take weeks to accomplish! Typically a color correction is fairly expensive, extremely time consuming, and may damage your hair. Why is a Color Correction so Expensive? Well friends, color corrections tend to take up the entirety of a stylist’s day. This often means seeing less clients, which in-turn means making less money that day. 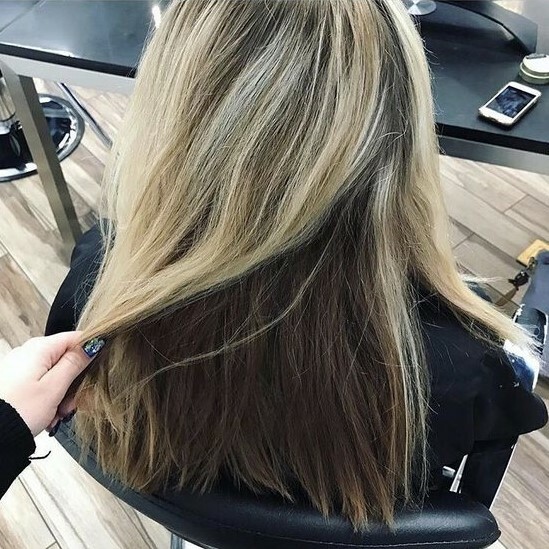 Some color correction appointments can take up to 6 hours or more, and the stylist has to use mass amounts of color to achieve the desired tone. Properly applying the right color is crucial when it comes to fixing someone’s hair during a color correction, and this takes time. After you’ve been lightened or had your light hair filled with pigment, your stylist still needs to tone you with just the right colors to get rid of brassy tones, green tones, red tones, etc., which is a massive step in the color correction process. 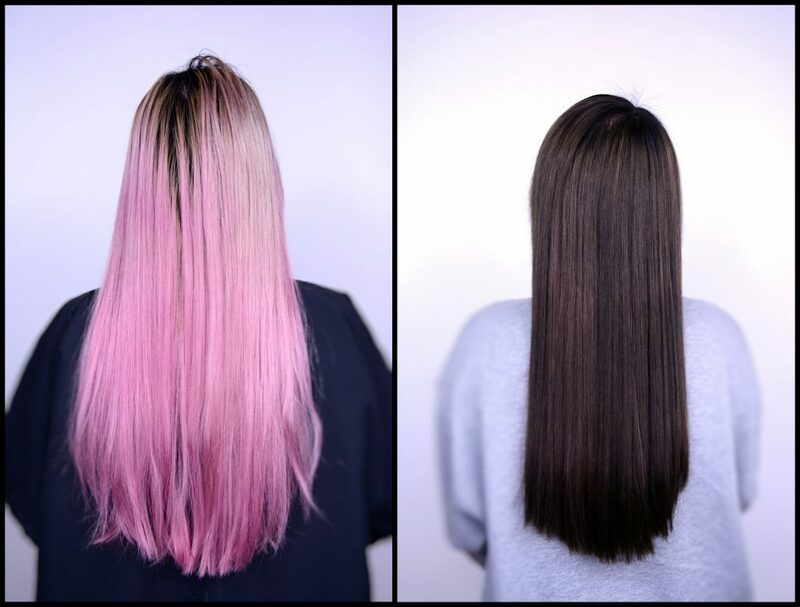 Before (left) and after (right) of a color correction by Courtney. 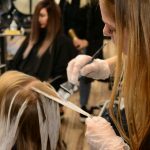 Most salons will charge about $100 an hour for a color correction, depending on the severity of the situation, and a consultation is VITAL to getting the look you want. Always book a consultation before making a color appointment, especially if you believe you need help correcting a mistake in your color. 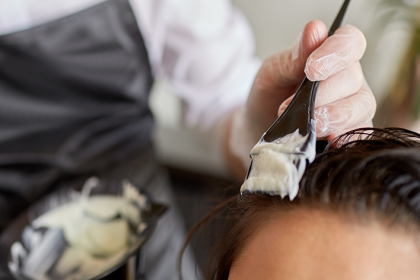 Fixing someone’s color does not always require a full-blown color correction, but again, have a consultation with your stylist and allow them to walk you through the options that will help you reach your hair goals AND keep your hair healthy. 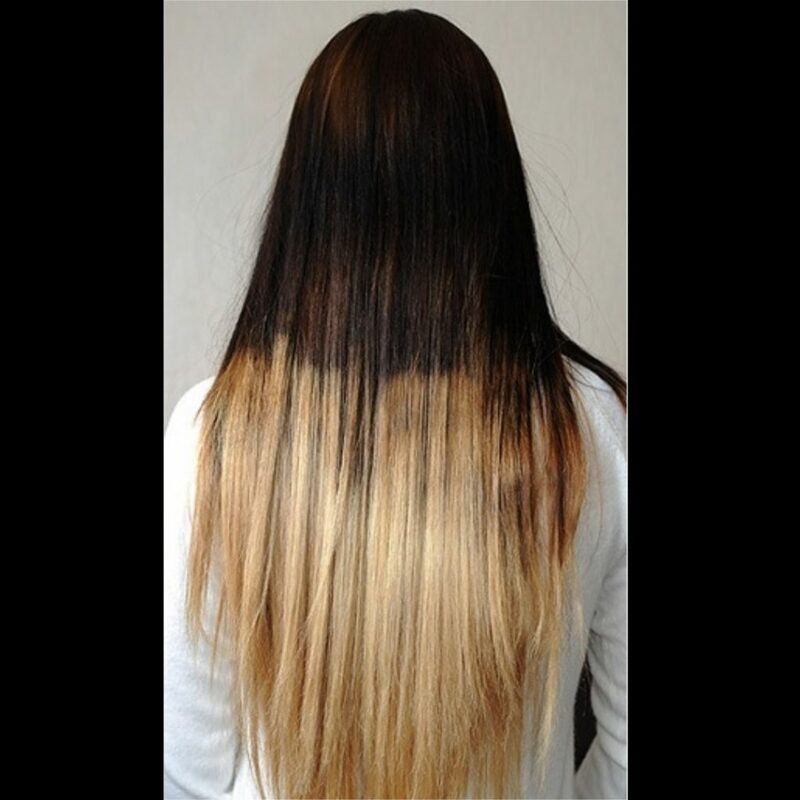 A stylist may also recommend getting a haircut along with your color correction to get rid of damaged ends. We have had so many clients call us for help after trying to lighten their own hair at home, and let me tell you… It always goes badly. Often times the client’s hair will be fried to pieces and multiple shades of orange and gold, and nobody wants that. Please let a trained professional help you; they are trained professionals for a reason! How Do You Know if You Need a Color Correction? Have you ever taken a big chance on a new look only to find out that you don’t like the color, or it doesn’t go well with your skin tone? (Check out this Redken app that lets you virtually “try on” new hair colors!) Or maybe you look at your hair color a couple weeks after you had it done and realize that your blonde has become super brassy, or your brunette is a little more red than you’d like? You may need a color correction. 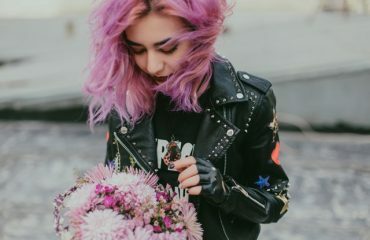 In terms of blonde being slightly brassy and brunette showing a little red, you may be able to fix that with a toner service, where your stylist may decide that a glaze is enough to correction those little imperfections in your color. So, if your hair color is not what you wanted, see a professional and let them determine whether or not you need a color correction. 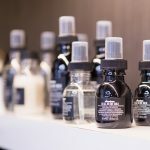 Your hair stylist may also recommend getting a deep conditioning treatment, or purchasing a deep conditioner to use at home to help reverse the damage caused by coloring your hair. We recommend Olaplex No. 3, which is an awesome deep conditioner that repairs damaged hair and strengthens the hair’s molecular structure, as well as the Minu Hair Mask, which is a deep conditioning mask for colored hair that restores shine and repairs damage to colored hair! Another way to breathe some life back into overly processed hair is to try out a Keratin treatment! (Check out our post on Keratin treatments here!) Ask your stylist about what deep conditioners would work best for your hair texture, and be sure not to over use it! Thanks for reading the TouchUps Beauty Blog! We hope we answered your questions about what color corrections are, how much they cost, how much time they take, and how to know when you need a color correction! Don’t forget to always schedule a consultation with a hair stylist if you don’t like your hair color before trying to fix it yourself. <3 You can even check out our post on consultations here! Join the beauty revolution with us by following us on social media! 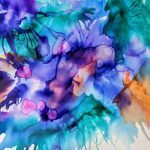 Check us out on Instagram, Pinterest, and Facebook! You can also subscribe to our newsletter for exclusive deals and discounts, HERE!